After ice skating, we couldn't bring ourselves to head indoors on such a great sunny day. The three boys were wiped out and ramped up simultaneously so we decided to head out on a family bike ride, hoping to soak in some good vitamin D. Our first stop-- our local bike shop to have the guys there take another look at the gearing of the bakfiets which has been giving us some trouble in colder temperatures. 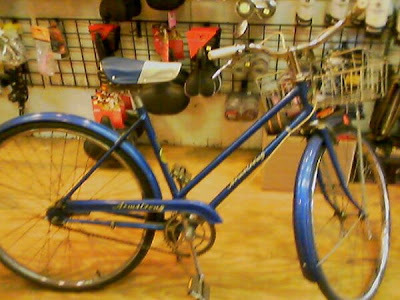 As we walked through the front door, I spotted a pair of women checking out this gorgeous blue vintage three-speed. I made a quick bee-line to the bike and saw it was... wait for it, an Armstrong! I am not sure I've openly revealed this before on the blog, but yes, that IS my surname. I started gushing over this lovely bike and the woman who was deciding whether or not to buy it, thought I was some sort of store 'plant' sent in to close the deal with my flowing compliments on this cool ride. She decided to put a deposit on the bike and headed out of the shop. I immediately started asking questions about it and learned that not only is it an Armstrong, but one from the year of my birth, 1969. Now come on. Is it too much to hope that she decides not to buy it? "Wow, we didn't recognize you in a car." I see that as a compliment of the highest order. And while I am using this space to boast, why don't I add this one? "You've got a cool mom." I was perhaps the only crotchety person in my school community today who was bummed about the snow day. This is a particularly busy time for me in my work and missing a few important appointments today puts me in a quandary about just when I can reschedule them. Once I recognized that this was well out of my control and hey, it's not brain surgery (no one will die on the table), I just let it go and decided to enjoy the day fully. The boys happily stayed in their p.j.s all morning, as did I, and while they played a variety of building and board games, I tucked into a new book, Joe Kurmaskie's Momentum is Your Friend. I read a bit about Joe at Totcycle since Julian is reading Kurmaskie's latest book, Mud, Sweat, and Gears. Kurmaskie, who calls himself The Metal Cowboy, has written a lot about his two-wheeled adventures and what draws me to him particularly right now is that his latest adventures involve serious family cycling. 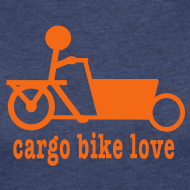 We are not talking "Isn't it great that I bike commute four-miles round trip to school with two of my sons" but "Let me cycle across the U.S. with my seven-year-old son on a tagalong bike and my five-year-old in a Burly trailer." Like that serious. Oh, and then in Mud, Sweat, and Gears, cycling with his wife and now three kids in Canada. And while, I was cocooned in my warm apartment today, hanging in a hot bath, I reached this passage. And I had to stop. And re-read it. And then call P to come and listen to it as I read it aloud. And now I share this with you. While on his cross country bike adventure, Kurmaskie meets a variety of folks, one of whom looks at Kurmaskie's kids and remarks that he should not try to tackle a particular road by bike. "'You wouldn't want anything to happen to them,' Roy points out. Which is not categorically true; I want all sorts of things to happen to my children. I want them to smack line drives during clutch moments of baseball games, smell the sweet bite of creosote bushes in the Arizona desert after an August monsoon, eat a pile of messy short ribs dripping in Kansas City's best BBQ sauce, and then sleep off their food comas under the whispery shade of a willow tree. I want them to stick up for themselves when it really matters, or slow dance with that girl [or that boy*], the one that makes them uncool and cotton-mouthed, at the junior high school mixer. I want them to find themselves at a loss for words from the beauty of the world, and make up fantastical names for constellations under the open sky this summer. What I don't want is something horrible happening to them. That's what he really means. It's a small distinction, but when magnified through the video black magic of Madison Ave. and filtered by the unfounded fears of parents fueled by the nightly news, it's what cheats us all of so much. It keeps too many kids of this generation inside the trophy cases of climate controlled cars, fully insulated houses, and carpeted tour buses. Parents think they're being responsible for eliminating every possible risk, but that's just a fairy tale someone keeps selling them. In the end, no one's safe. But it is possible to protect a kid from his own childhood. Don't misunderstand: Car seats and childproof caps have saved countless lives, and I own all that gear and more; but keeping kids under behavioral arrest, constantly lathering them in antibacterial hand lotions, moving them from one organized activity to the next in the equivalent of armored vehicles only narrows their vision, making them observers of their own days. The trick, in my view anyway, is to manage risk while leaving room for kids to explore the world while they're actually in it. Cutting through the guidance-counselor-speak, just let 'em fall down a few times, get dirt under their nails and end even one day wet, tired, and hungry. Go ahead and let them reach for things everyone's forgotten are important" (p. 91-92). Amen, my brother. And with that, I climbed out of the tub, rallied the troops, put snowpants on right over our pajamas, and went out for some rockin' sledding around the corner, dodging trees, and laughing all the way. Oh, and if you are wondering, Joe fully endorses his boys crushing on whomever they may like as well. Last month, our local bike shop started a new feature on its website called "Commuter of the Month." Look who got featured this month. For Christmas, I got a brand new Flip video. It has taken me awhile to break it out but here are a couple short videos I took of two of my fellows out on bikes, a small glimpse of my family's love affair with our two-wheeled vehicles.